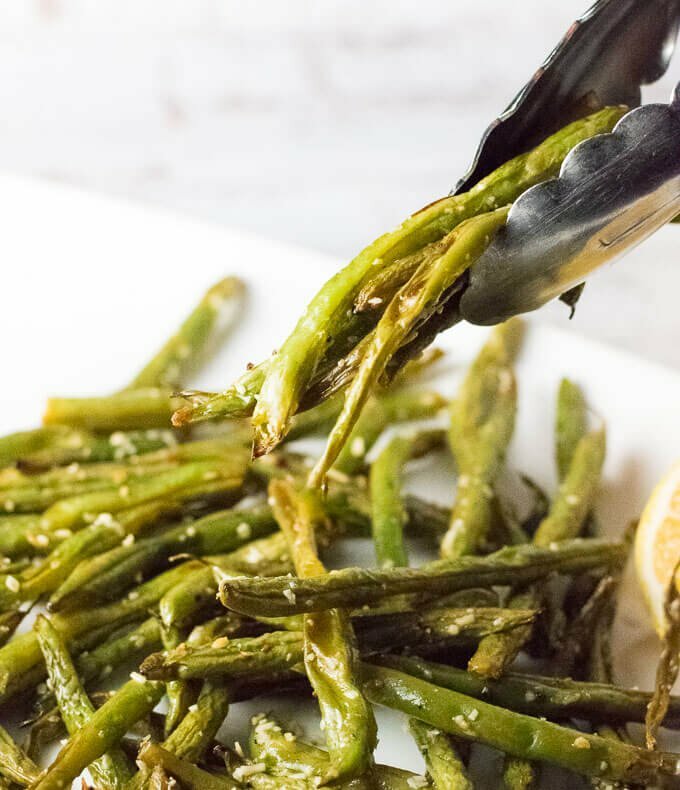 The bright flavor of these Roasted Lemon Parmesan Green Beans is the perfect compliment to any entree, plus they are quick and easy to prepare! All too often it seems vegetable side dishes are the ugly-duckling of the table spread…. ignored, taken for granted, and largely unloved. Poor hideous little ducklings. After all, who wants to fill up on canned peas when there is more meatloaf to be devoured?! 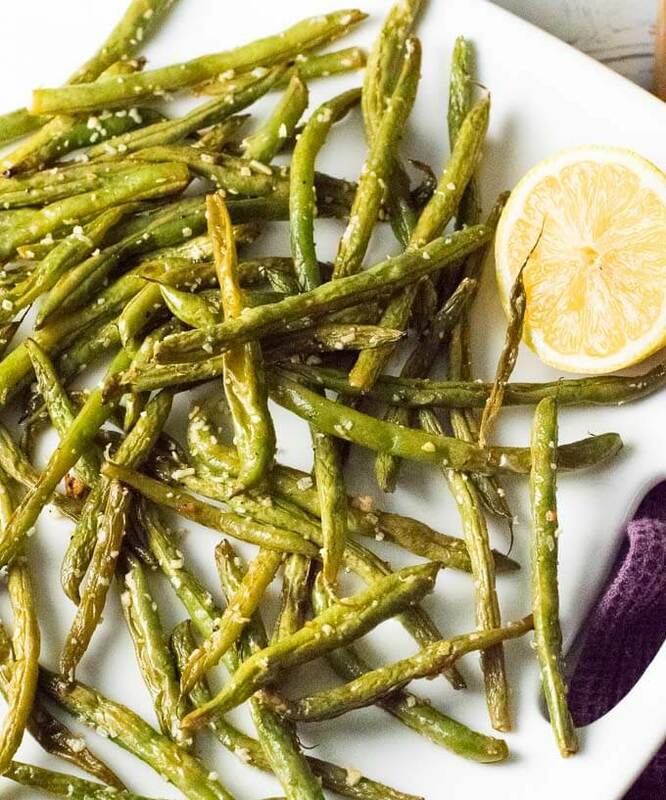 Well, let’s give the boring vegetable side dish a facelift with these Roasted Lemon Parmesan Green Beans. Salty, tangy, and light. These beans pack the flavor, without being excessively filling. Bring on the dessert! These oven roasted beans are such a versatile side dish. They are right at home dressing up a hearty steak dinner, as they are complimenting a vegetarian entree. They are a no-brainer to include in your holiday meal plans because they accommodate so many different diets. Though I guess they aren’t really vegan-friendly, but that’s OK because I don’t think vegans commune with us heathens unless proselytizing on a mission trip. Many Parmesan Green Bean recipes call for shredded Parmesan. Personally, I think you will find grated Parmesan is better. Its finer texture adheres to the green beans better than the longer stringy shreds. I also really enjoy the bright tangy flavor the splash of lemon lends to the dish. Though if you hate lemon, you are certainly welcome to omit it without any adverse effect on my final dish. I also recommend using fresh green beans for this side dish. Though you can successfully substitute frozen beans, fresh will provide you with better texture. I have an oversized mixing bowl that I love using for recipes like this. It is the perfect vessel mix ingredients together without having to worry about making a mess. I think every kitchen should stock a large bowl for this purpose. In a large bowl, add the green beans, olive oil, Parmesan, salt and pepper. Then squeeze the juice of 1/2 lemon over the beans as well. Toss to combine. Place beans on a baking sheet lined with aluminum foil and bake in the oven for 15 minutes. IF YOU LIKED THIS RECIPE you will love my Garlic Ranch Potatoes recipe too! 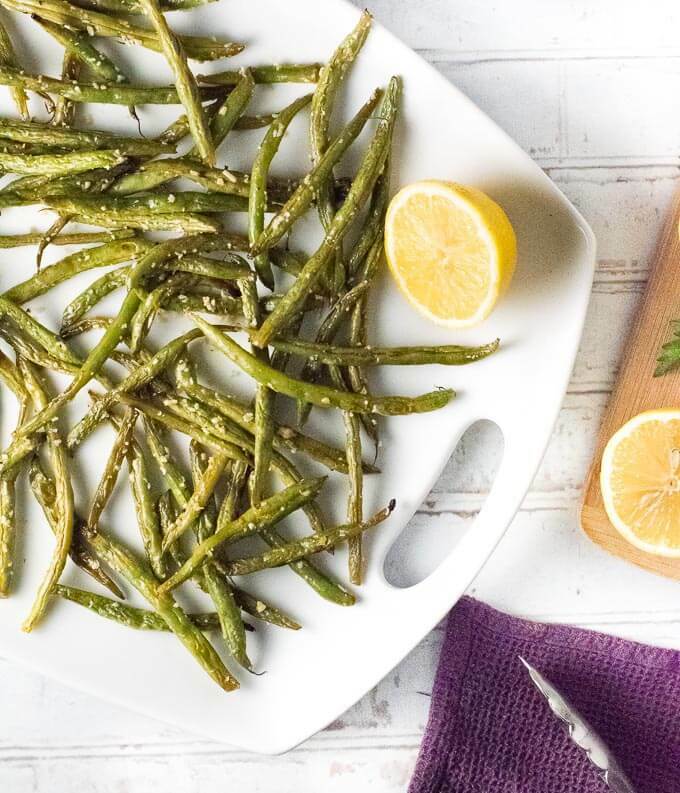 If you enjoyed my Roasted Lemon Parmesan Green Beans recipe then you should probably like me on Facebook and follow me on Pinterest too. That’s what I would do at least, because if you don’t get to know me but you still use my recipe it is kind of like taking candy from a stranger, and your mom taught you not to do that. Don’t disobey your mom, subscribe to Fox Valley Foodie today. This is a great side dish!